Mark Zuckerberg, how investors have underestimated you. Depending on how you look at it, Facebook is either on a tear or washed up. eMarketer predicts Facebook will generate $5 billion in revenue this year, with $4.2 billion from advertising, taking 4% of the global digital ad spend in 2012 — not too shabby. But Facebook also faces the law of large numbers, meaning it’s hard to grow once you’re already damned big. That eMarketer forecast of August was downgraded by $1 billion from its previous prediction in February; ouch. And Facebook has two other huge challenges — it’s making pennies from mobile and online video, the fastest-growing media channels in advertising, and Facebook is still a weakling in the Asia-Pacific, the market expected to grow fastest in ad spend over the next few years. $1.5 billion is nothing. Facebook is just getting started with your data. There’s a much larger play here as well — if you pay for your post with a credit card or PayPal, for the first time Facebook is training you to give it your payment mechanisms. OK, so you’re addicted to Facebook. And Facebook has your credit card. Whatcha think you’re going to do when Facebook makes it easy for you to buy stuff inside Facebook? I’m not talking those little Facebook ads for things you don’t want — I’m pointing to a store that rivals Amazon.com with everything you desire on your own terms. Facebook has already built this store: millions of brands have “Facebook pages” touting Pepsi, Coke, Barack Obama and Mitt Romney. 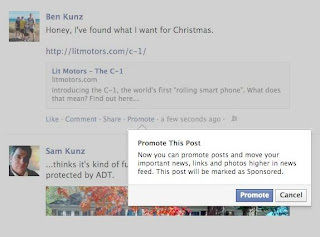 All Facebook has to do is install the cash register, and you better believe when those pages become e-commerce functional, brands will promote ways for you to buy stuff inside Facebook. And of course Facebook, with your payment information now loaded, would helpfully transform your mobile Facebook app into a mobile wallet … extracting a cut of the billions of dollars that are paid to AmEx, Visa and Mastercard in annual financial transaction fees. Go out for a nice Italian dinner and swipe your newsfeed at the register, and you could pay while also telling all your friends about the great night out. It’s all so brilliant. A $7 offer. Which leads to $1.5 billion in revenue as Facebook collects your credit card numbers. Millions of brand pages waiting to be turned into an online mall. 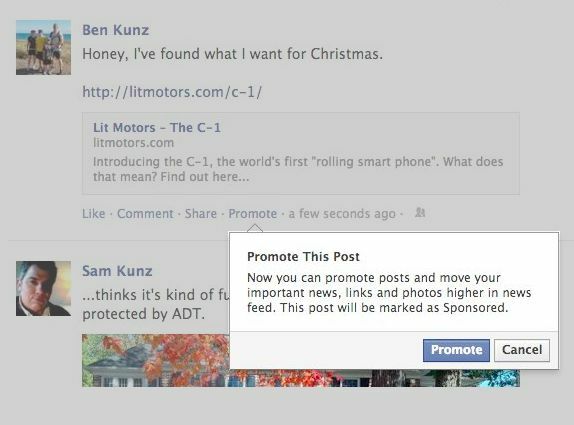 Marketers promoting Facebook for free by including their “Like us on Facebook” in every one of their own ads, stimulating demand. And a Facebook mobile app that, once preloaded with your credit info, could rival Visa. Zuck, some days I really like you. Are you serious? I post a lot on Facebook. Sometimes I post more than 10 times a day. I am not making enough money posting to pay the $7.00 fee. When is this supposed to happen?